switch. | A digital magazine and blog about, but not limited to, the University of Virginia and Charlottesville area. If you haven’t seen the chalking, the tweets, the Facebook page/statuses/ events, etc…allow me to clue you in. The Student Hip-Hop Organization has arrived at the University of Virginia. The members include two of Switch’s very own, Chuck and yours truly. More importantly, tickets for their upcoming G.O.O.D. 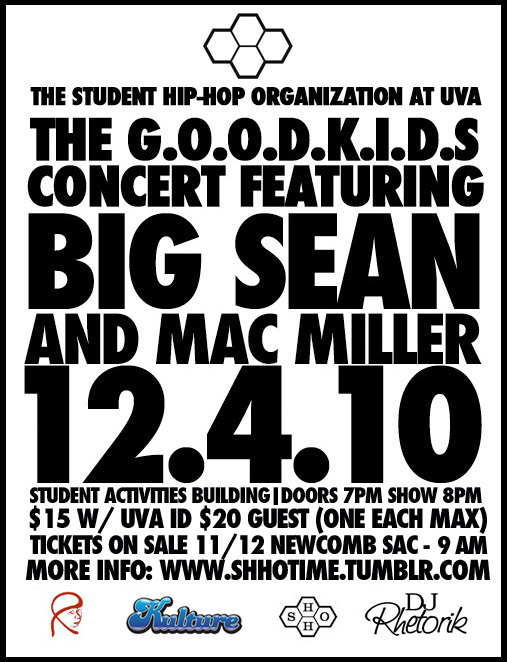 KIDS concert featuring Big Sean and Mac Miller go on sale tomorrow at 9 AM in Newcomb Hall, at the SAC. A limited number of tickets will also be available online for those who are unable to attain them at Newcomb. For more information on ticket sales and the show. See S.H.H.O. tumblr (link below) and the Facebook event page. Stay tuned for more info on S.H.H.O. but in the meantime, check out http://shhotime.tumblr.com/. 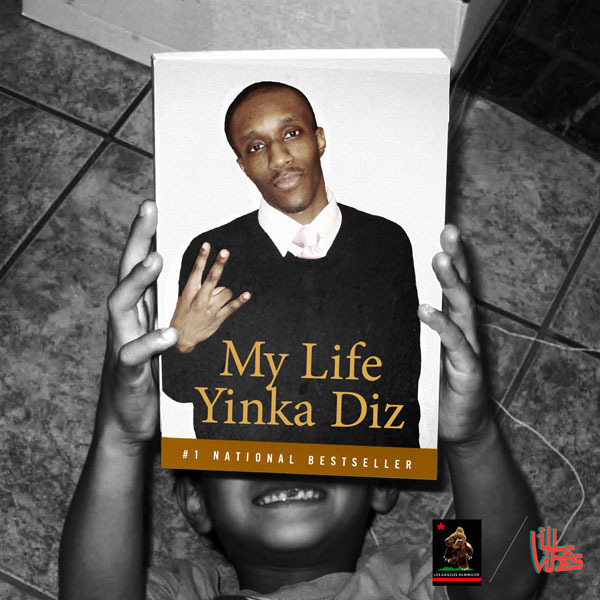 Stumbling upon Yinka Diz, a UVA alumnus who currently resides in Washington DC, was in fact refreshing. Although Diz has found professional success as an IT Project Manager in the government sector post-graduation, this rapper/producer has yet to veer far from his passion for music. Diz began producing shortly after, in high school, in an attempt to stand out. Unacquainted with any producers, his craving for his own original beats further pressed his aspiration to produce music. While at UVA, Diz was a DJ, which not only provided monetary rewards but a vast network and financial sponsorship. “As an artist, I interacted with the greater C-ville area more than the campus. I was a part of a hip-hop group known as The Kartel and we did shows throughout the Charlottesville area at venues like Starr Hill and Rapture with other local acts such as The Beetnix and Nickelus F,” Diz remembers. For most, life post-graduation entails losing sight of dreams and assuming reality. But there are a few, who never halt their passions, regardless of the circumstances. These are the inspired. First and foremost, I would like to personally apologize for our hiatus this semester. BUT have no fear…. SWITCH. is back. And apparently, great things occur in twos (well in this case anyway) because guess who else is free of his shackles and chains???!!! 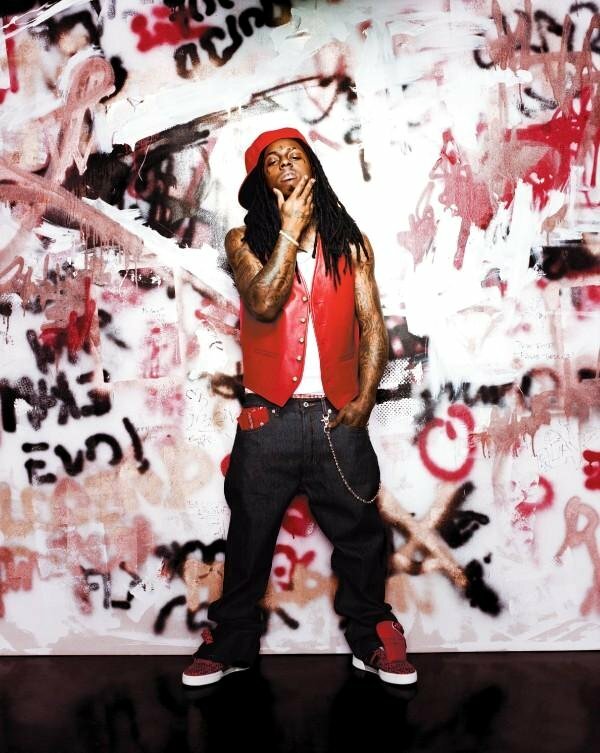 YEPPPP WEEZY’S A FREE MAN! Your “FREE WEEZY” shirts are most definitely irrelevant at this point. -well at least until his next jail sentence. …anyhow, get ready for a COMEBACK. Twofold. Like what you heard? Join Oluponya Every Other Friday at O’Hill Forum for a night of music by our group and others at Open Mic Night! Also watch Oluponya light up the stage this fall at the Annual Fall Concert Coming up!! Details to be determined! I know you’ve all been patiently waiting this moment! So Have I. CMON SON IS BACK! So for those of you who don’t know about it, CMON SON was a series last semester where I would post some of UVA’s “finest moments” lol. (both the quotes and the “lol” are necessary). SO! With out further adieu lets get into it! This Stupid block and all the ones around it are REALLY annoying. I mean COME ON SON! Newcomb is the center of the grounds! Everything you need can probably be gotten to through this way. 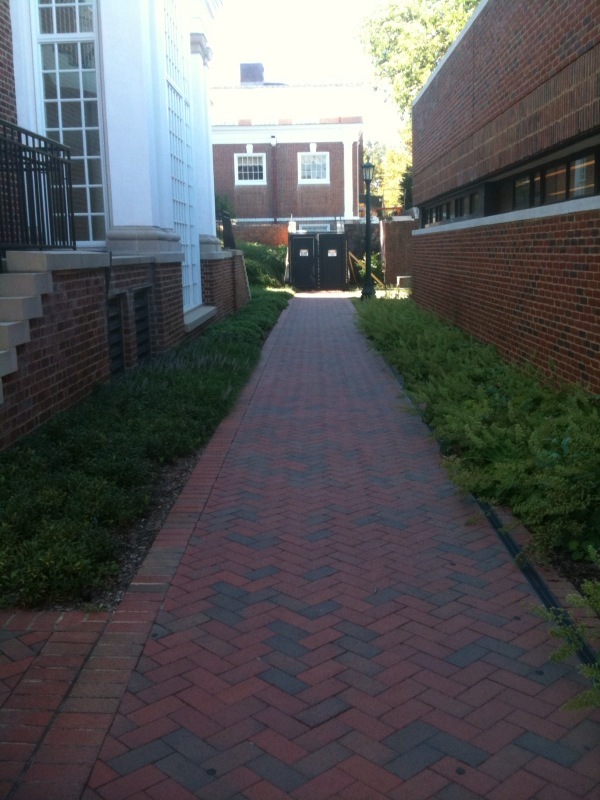 AND YET UVA decided that fall semester was the perfect time to block this path for us making us have to walk to the opposite end of newcomb just for food. CMON SON! Why would u do that? You’re REALLY in the way right now. Get it together UVA…. 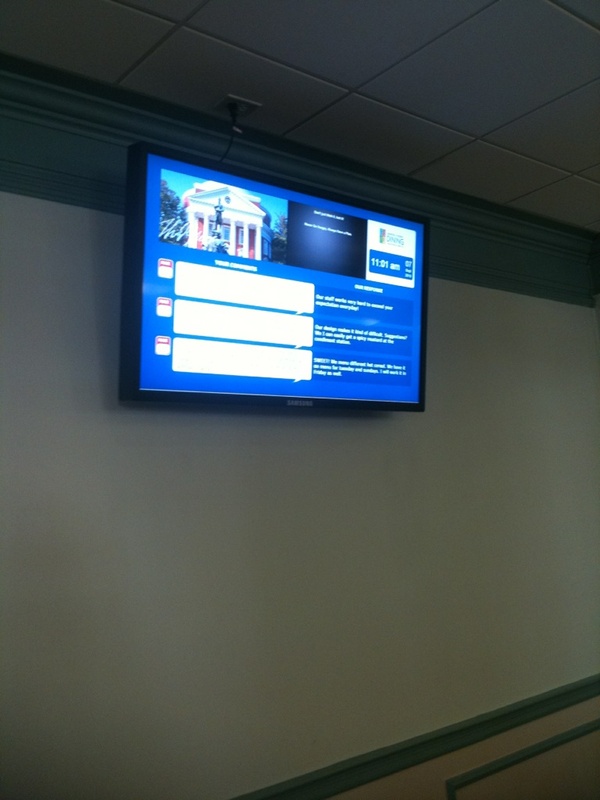 So once you travel far and wide to get into newcomb, you’re usually barraged by these television screens. UVA dining thought it would be a nice idea to allow students to text their comments about dining to this screen and display it. This only leads to “smart” comments such as “Can we have some more of that omnomnomy pasta from last night?”, “last night’s dinner selection was off the chain!”, “is the waffle batter vegan?” and my personal favorite “vegan ice cream?”. COME ON SON! I know you guys have better things to do with your time then to try and be witty on a dining suggestion screen. And vegan ice cream? you know what they call that? ICE. smh…. 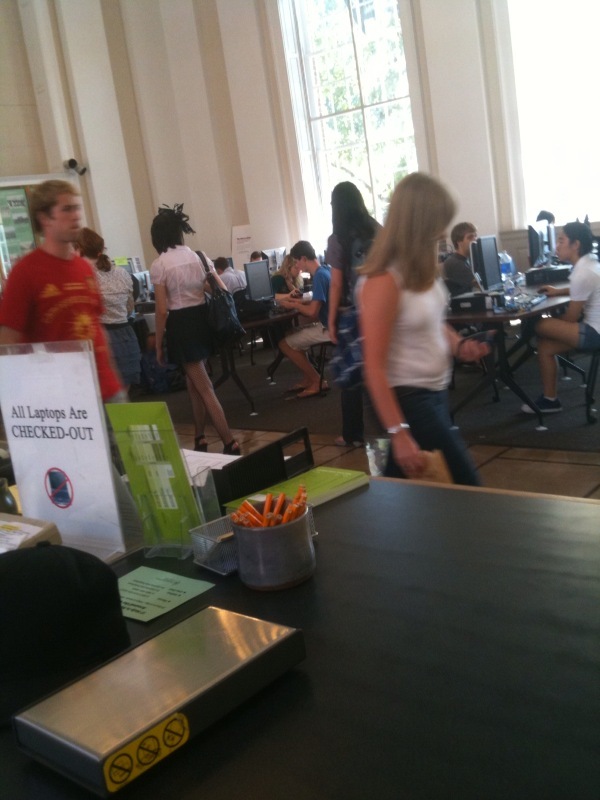 Now one day after contemplating how exactly I would get out of newcomb jail…i mean newcomb dining hall and what the heck “omnomnomy” means, I was passed by this bright young 1st year. 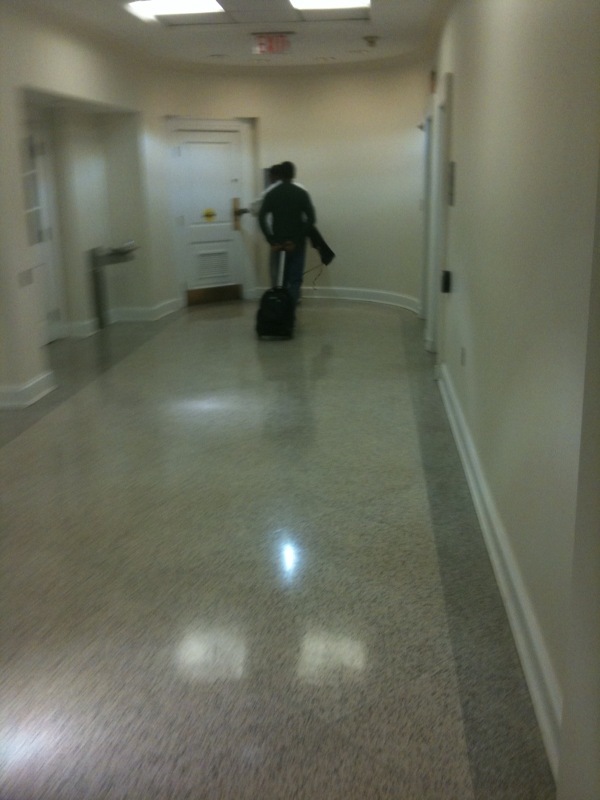 With, as you can see, a rolling bookbag…..CMON SON! Rolling bookbags were NEVER hot, will NEVER be cool, and you’re really just asking to seem socially awkward. Please believe if I see you again I’m kicking your bookbag and watching you drag it on its side. Maybe that will be enough incentive for u to get a REAL BOOKBAG…. Honorable mention goes out to all those GAGA fans who dressed up at like 1 in the afternoon for the concert. WOW guys. Example? The title speaks for itself and there is very little to say. Like many other Lupe Fiasco fans I’m tired of waiting for the release of the LASERS project which has been on delay by Atlantic Records since January. And now the fans are taking action. I came across news of this petition on The LupE.N.D. blog which is a well-recognized and reliable fansite for all things Lupe Fiasco. I put my good faith in and signed the petition and I’m asking for others to do the same. Sign “The Release Of The Lasers Album Petition” here. This post has been a long time coming. Before final exams started I was approached by some peers who started up a new CIO here at UVA. I was intrigued at the concept and at the passion these students felt to come together and start up their own organization and I can respect that kind of ingenuity. Allow me to introduce the Society Awareness of Vitality for Everyone (SAVE). SAVE’s purpose is as follows. The purpose of SAVE is to bring awareness of the health disparities experienced by minorities in this country and to educate the student body and Charlottesville community on what can be done about it. SAVE defines health disparities as a substantial disadvantage in areas of health, disease prevalence, mortality and the quality of health care experienced by racial and ethnic minorities. Members of SAVE will serve to promote healthier lifestyles for the minority groups that are at high risk for suffering from these health disparities. I strongly encourage any members of the student body who are interested in educating the community on health issues and be sure to look for SAVE at the Student Activities Fair next fall. Until then you can find more information on the organization blog or by following SAVE on twitter. Read the interviews after the jump.